Welcome to the website for Albertans Advocating for Change Together. 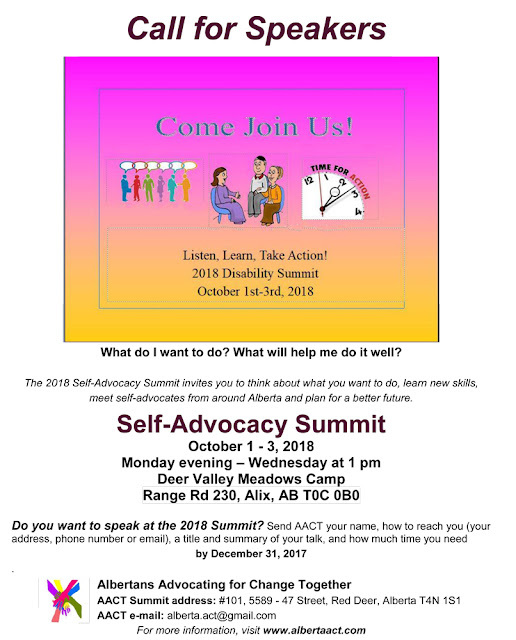 We are a network of self-advocates and self-advocacy groups across Alberta. We find out what self-advocates are doing and share it with others so we can all be stronger. We find out what is important to self-advocates and make sure they have a provincial voice. AACT sent its final report on the Summit to the Community and Social Services Ministry of Alberta, who helped us with the Summit. We sent copies of the report to regional self-advocacy groups. You can read the whole report or just the parts you want to read on our Summit page. If you want your own copy of the report, ask for it at alberta.act@gmail.com. AACT took part in the PDD Review! Click here to read what AACT sent to the PDD Review panel based on what self-advocates said at the Self-Advocacy Summit. We hosted a Self-Advocacy Summit October 1 - 3, 2018 at Deer Valley Meadows Camp near Alix in Central Alberta. Our theme was "Listen. Learn. Take Action! "About 120 self-advocates and allies came and talked with members of the Premier's Council on the Status of Persons with Disabilities, the PDD Review Team and the Disability Advocate's office. We identified lots of issues and came up with good ideas to make things better for people with disabilities. AACT will share these good ideas with the government. Check out our newsletter for the Summit story with photos. This year we started a list of speakers who will talk to self-advocacy groups. You can contact anyone on the list to see if they will speak to your group. We also started a feature in our newsletters called "Tips for Self-Advocacy Groups" to help all of our self-advocacy groups be stronger by learning from each other. This year we put in a proposal to the government to help self-advocacy groups learn to make videos using cell phones and other devices and free or cheap video-editing apps. Videos are a good way for groups to show what they do, talk about important issues and get new members. They did not give us an answer about our proposal. AACT does not get a regular grant from the government to do its work. We have to raise money through memberships and fundraising. We had a 50/50 draw for up to $1500 (if we sold all the tickets) on September 30, 2015. It helped pay for us to have a face-to-face meeting of the AACT Council. We are very excited about the Self-Advocacy Summit we held on June 13 - 15, 2014. It was free for up to 200 self-advocates and their supporters. Participants had a great time seeing old friends, meeting new people and learning from each other. We want to know what you liked best about the Summit. Follow us on Twitter @AlbertaACT.